Space Images | It's a Bird, It's a Plane, It's a... Spacecraft? It's a Bird, It's a Plane, It's a... Spacecraft? 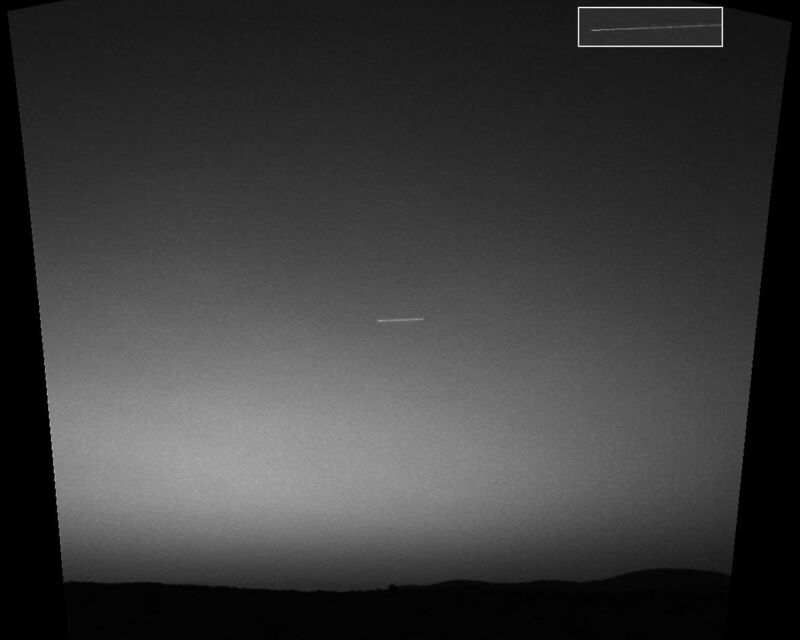 Observing the sky with the green filter of it panoramic camera, the Mars Exploration Rover Spirit came across a surprise: a streak across the sky. 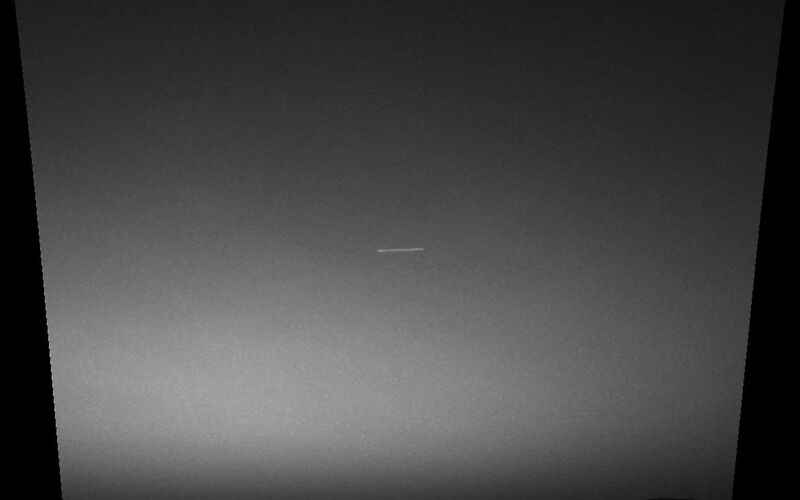 The streak, seen in the middle of this mosaic of images taken by the navigation and panoramic cameras, was probably the brightest object in the sky at the time. Scientists theorize that the mystery line could be either a meteorite or one of seven out-of-commission spacecraft still orbiting Mars. Because the object appeared to move 4 degrees of an arc in 15 seconds it is probably not the Russian probes Mars 2, Mars 3, Mars 5, or Phobos 2; or the American probes Mariner 9 or Viking 1. That leaves Viking 2, which has a polar orbit that would fit with the north-south orientation of the streak. In addition, only Viking 1 and 2 were left in orbits that could produce motion as fast as that seen by Spirit. Said Mark Lemmon, a rover team member from Texas A&M University, Texas, "Is this the first image of a meteor on Mars, or an image of a spacecraft sent from another world during the dawn of our robotic space exploration program? We may never know, but we are still looking for clues." 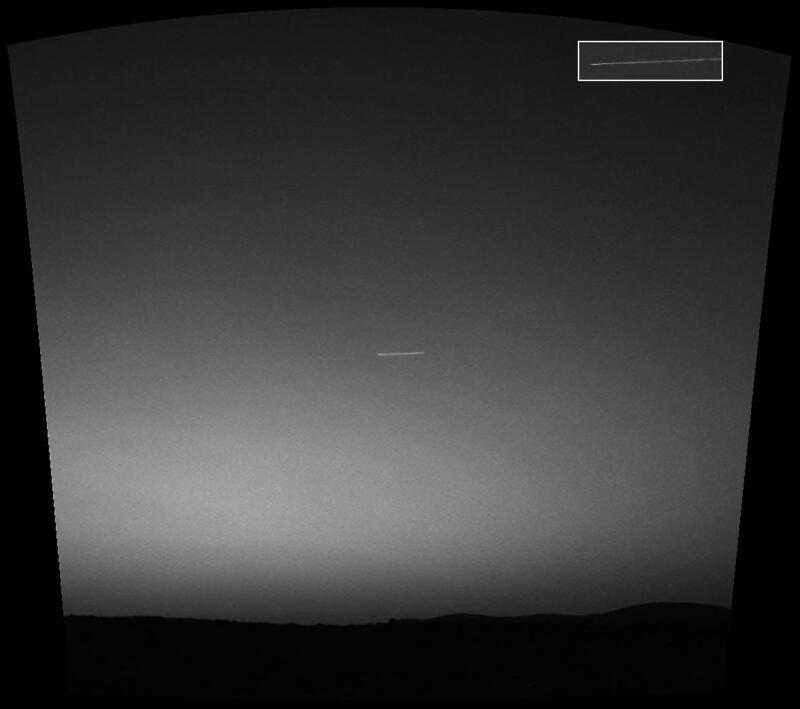 The inset shows only the panoramic image of the streak.